The Newest Freeride-XC competition, Allriders® Select´07, takes place in the BikeShow-Barcelona. The stairways next to the stadium at Palace Saint Jordi in Barcelona had a different use last weekend, when the Allriders select competition came to town. This unique new Freeride-XC competition format was originally founded in Girona, Catalonia, in 2004, and has attracted a lot of spectators due to its different approach to this sport. Races were staged in 10-lap formats, where Allriders® had to climb steep ramps to get to the top of the stairways, then descend them straight away, via a series of high drops and stunts, all the time battling other riders in races where the last rider gets eliminated at the finish of each lap. Xavi Cabau, from Allriders®Pro-SantaCruz, emerged as the overall winner after advancing through the different rounds, fighting at the last lap with his team mate, Pau Reixachs (Rexy), for the victory and the money prize, with the victory determined by which of the two could take the biggest drops fastest in the closing laps. Some of Spain’s most popular freeriders, including Carles Sabi and David Acedo, took part in the competition with varying degrees of succes. Sabi abandoned exhausted at the 3rd lap of the previous classification wave, while Acedo scored a successfull 5th position overall in the final. 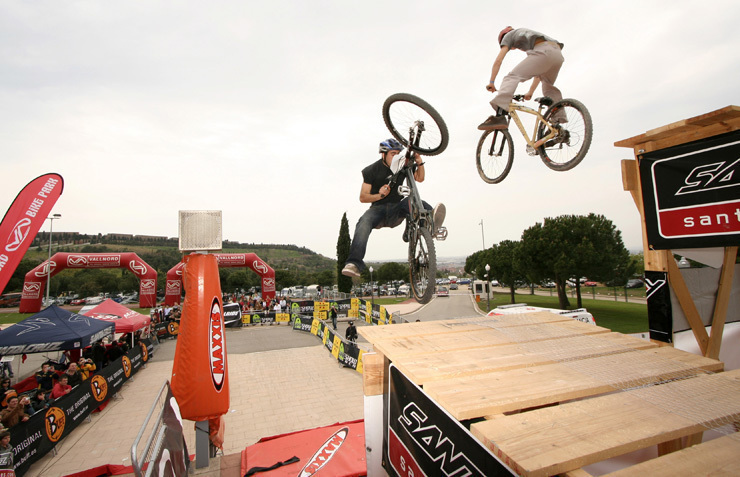 Afterwards, the Allriders® held a Slopestyle exhibition, won by Gerard Asencio with a 360 Drop and a no-foot-one-hand. 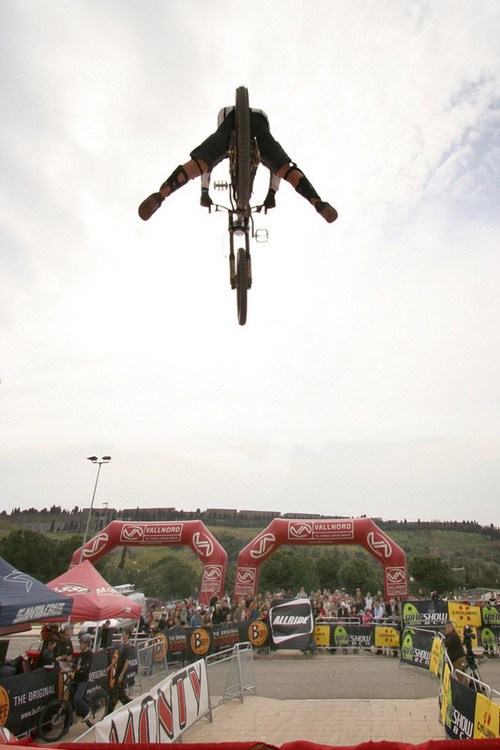 David Acedo landed second, with an X-Up in the biggest ramp and a suicide as well. 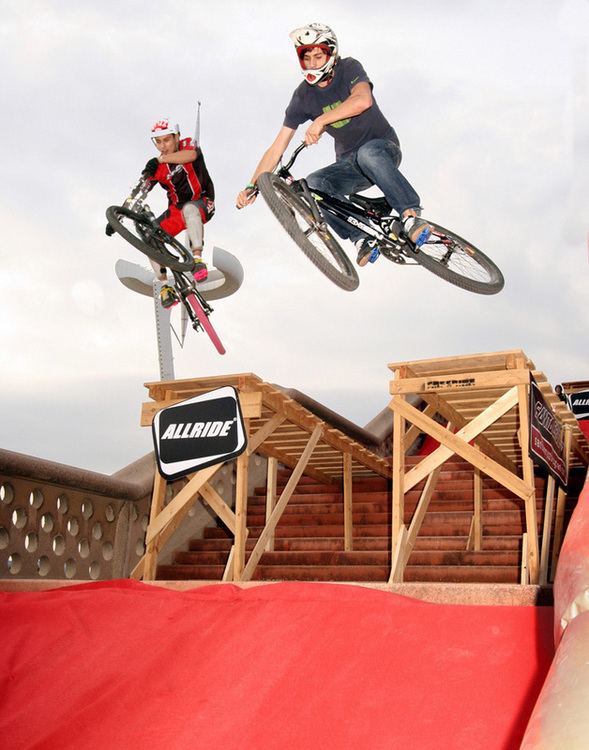 Allriders®Pro-SantaCruz pilots Cabau and Rexy featured well, in 5th and 6th position respectively. Could you be the next Allrider®? Pre-inscriptions for next edition are allready opened. Riders capables to stay on their bikes giving pedals and go down stylish in front any circumstance, can already send his curriculum with some pics to info@allride.org. Only the best 60 riders will be invited to enter this unique Freeride-XC event on the planet! Also there will be some free acommodations and other things for the riders that the organization will choose, capables to bring the competition into a next level.